Huawei has gained serious ground in the smartphone market this year, threatening Apple's position as the second-largest player. This is due, in part, to the success of its Honor brand, which gives consumers value-focused smartphones, like the Honor 8 and Honor 6X. Today, Huawei introduces a new model in the Honor line, the Honor 7X. It's perhaps its most attractive one yet, featuring a large edge-to-edge screen, solid internals and a dual camera at a highly attractive price. What exactly do you get? The Honor 7X gets a 5.93-inch display with a resolution of 2,160 by 1,080 and an 18:9 aspect ratio. Inside, there's an octa-core Kirin 659 processor with 4GB of RAM and a 3,340mAh battery. There's support for a microSD card slot. The camera setup is pretty unusual, both in the number of cameras and their type, for this segment. Huawei has fitted the Honor 7X with 16MP and 2MP cameras on the back; typically, the difference in megapixels is not as significant. On the front, there is an 8MP camera. What else should you know about it? Well, it comes with a fingerprint sensor, which is on the back, there's Android 7.0 Nougat on board (with EMUI5.1 on top), and it also appears to be water-resistant based on the images shared by Huawei. 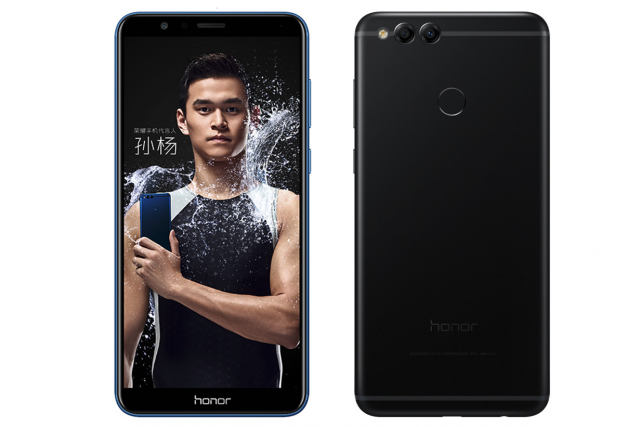 The Honor 7X, which was announced in China, will be offered starting October 17 for CNY1,300, which is about $200. That's the base model, which comes with 32GB of storage; there is also a 64GB version that goes for CNY1,700, or roughly $260, and a top-spec 128GB model that costs CNY2,000, or about $300.